Babe Ruth’s 138th career homer in 1921 tied Roger Connor’s MLB record. For the next 14 years, each of his next 576 dingers set a new mark. Imagine what $1,000 could buy at the height of the Great Depression. 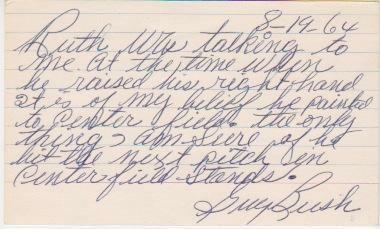 Babe Ruth made out this personal check to his wife Claire on July 1, 1937 for just that amount. 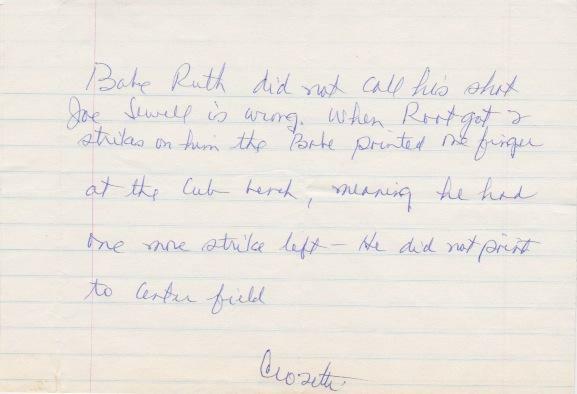 Signed “GH Ruth”, as was typical for legal documents, the check bears the name “Babe Ruth” on the left side. 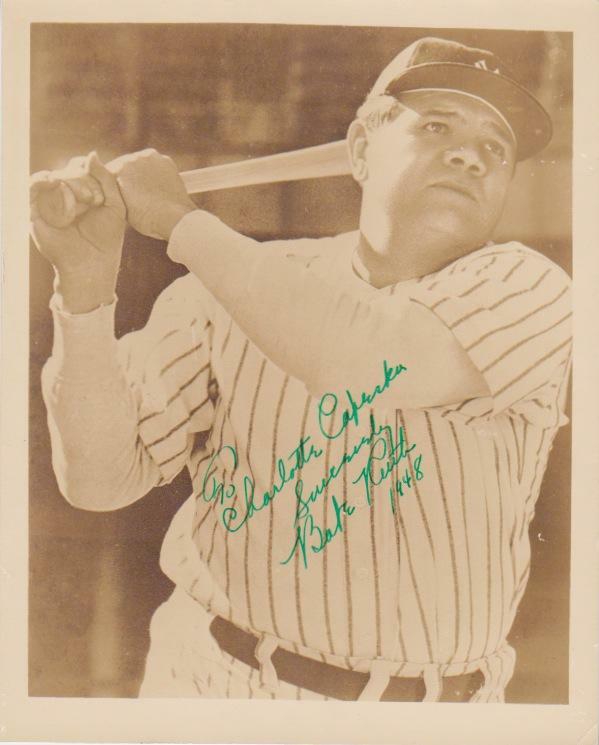 A prodigious signer, Babe Ruth autographs can be found on virtually every medium. Everything he signed continues to increase in value due to sustained demand. Of particular interest are autographed pictures of the Bambino. Ruth had copies of this photo that he signed later in life. A prodigious signer, Babe Ruth autographs can be found on virtually every medium. Everything he signed continues to increase in value due to sustained demand. Of particular interest are autographed pictures of the Bambino. Ruth had copies of this photo that he signed later in life. 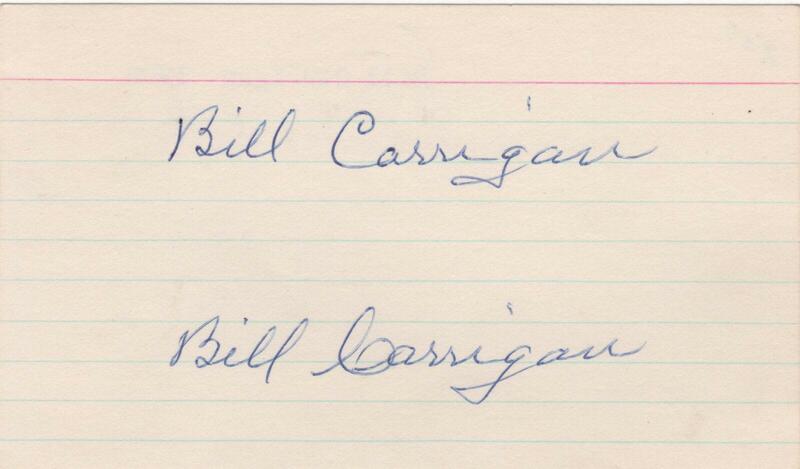 Most of the examples of his autograph on this photo are personalized and penned in green ink, just as this one is. 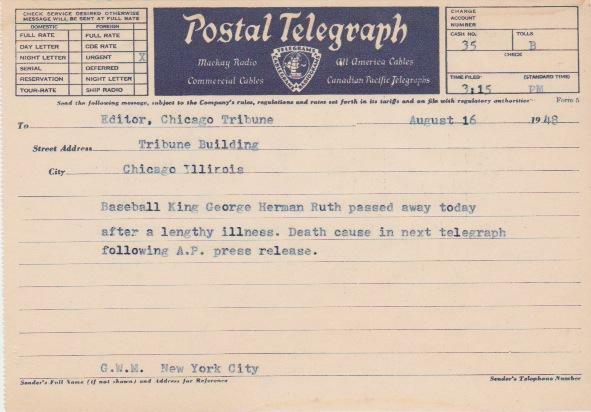 This telegram dated August 16, 1948 states, “Baseball King George Herman Ruth passed away today after a lengthy illness. Death cause in next telegraph following A.P. 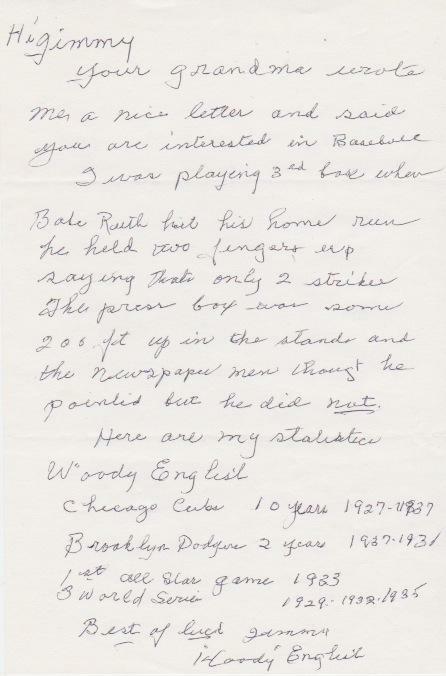 press release.” Only 53 years old at the time of his death, Babe Ruth was one of the most recognizable men on the planet. 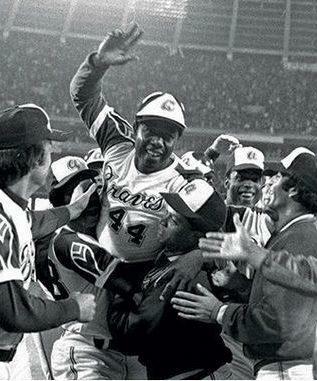 Baseball lost its greatest hero. Perhaps Ruth’s most mythical feat was his “Called Shot” in Game 3 of the 1932 World Series at Chicago’s Wrigley field. Did he point to centerfield and declare where he would put the next pitched ball? Hitting in front of Ruth that day was Joe Sewell who describes in perfect detail exactly what happened. 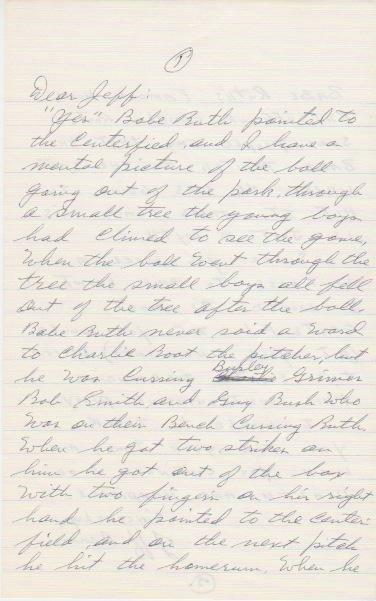 “ ‘Yes’ Babe Ruth pointed to the centerfield and I have a mental picture of the ball going out of the park…” Sewell states on the first page of his two-page handwritten recollection. 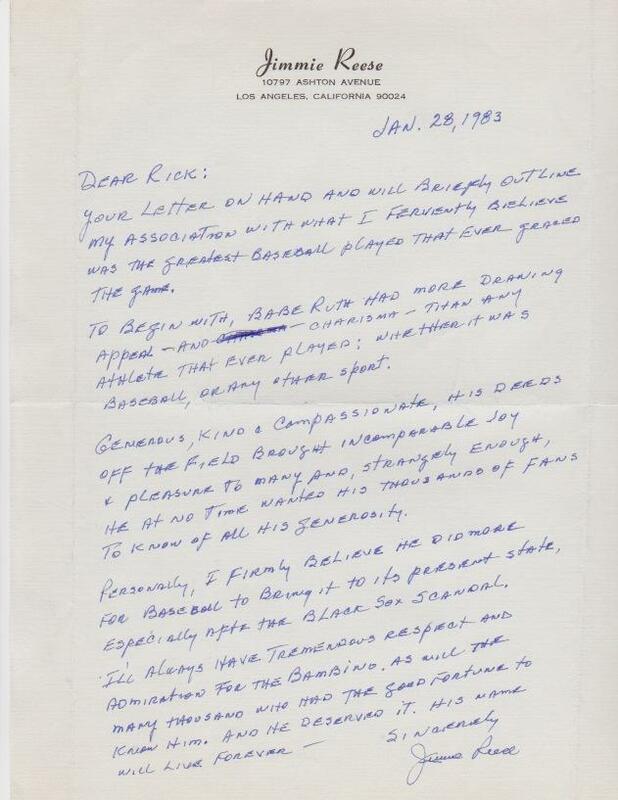 The rest of the letter is penned with perfect detail. 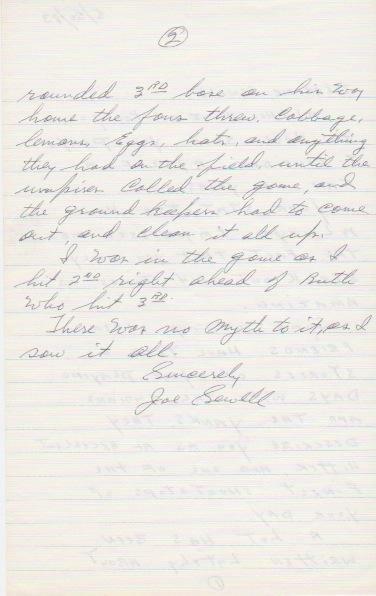 At the close of the letter, Joe Sewell sums up his take saying, “There was no myth to it as I saw it all”. Not so fast. “Joe Sewell is wrong. 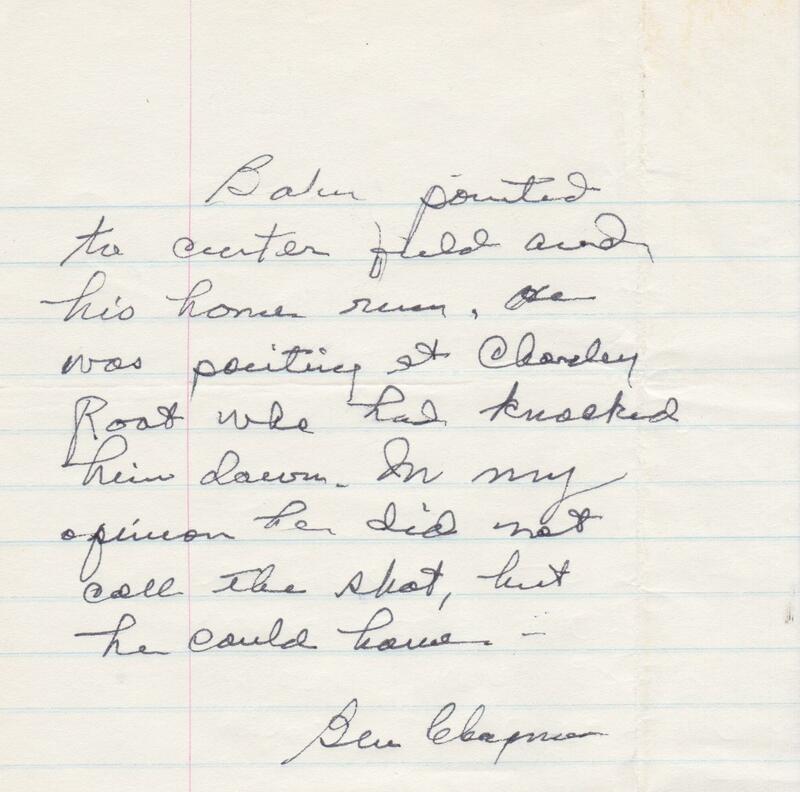 When (Charlie) Root got 2 strikes on him the Babe pointed one finger at the Cub bench, meaning he had one more strike left. 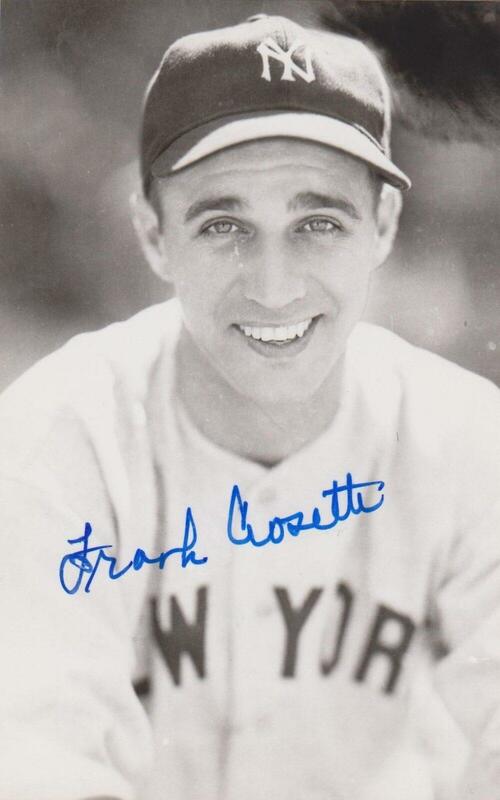 He did not point to center field,” says fellow Yankee Frank Crosetti, the starting shortstop and number eight hitter in the lineup that day. No wonder the debate continues eight decades later. 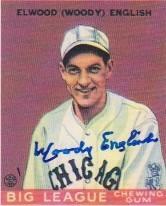 Woody English autographed this 1933 Goudey baseball card reprint depicting him in the 1932 season. 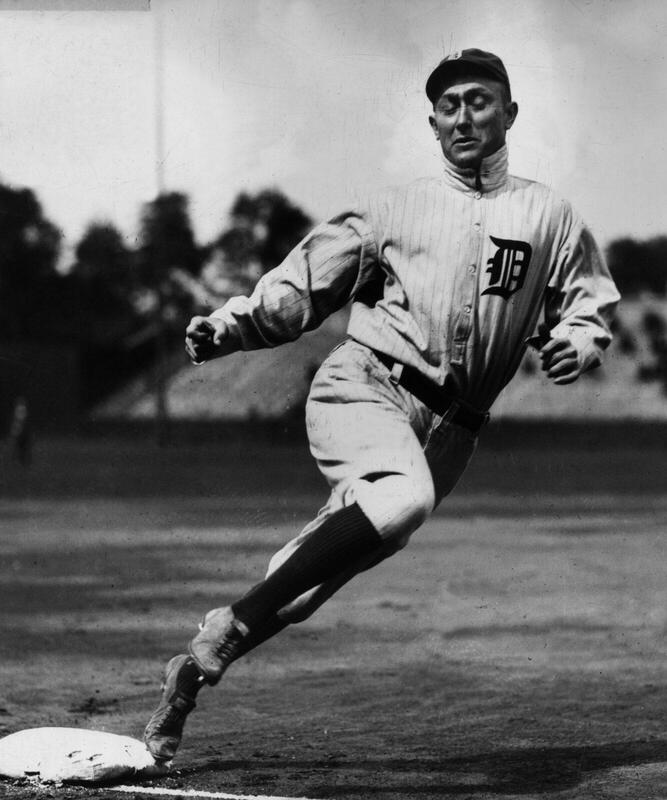 English appeared in Major League Baseball’s first All Star game in 1933 and played in two World Series. He finished with 1356 career hits and a .286 lifetime average. 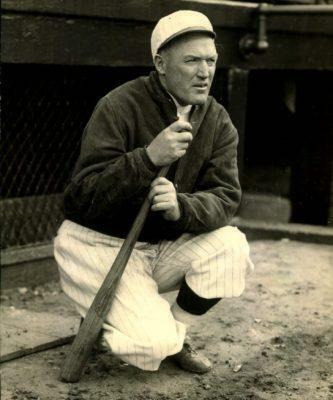 The third baseman twice led the National League in games played and finished fourth in MVP voting in 1931. 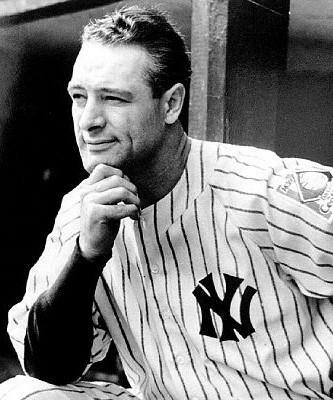 His finest season came in 1930 when he set career highs in batting average (.335), homers (14), RBI (59), hits (214), triples (17), stolen bases (13), and walks (100). Upon retirement, English returned to baseball as the manager of the Grand Rapid Chicks of the All American Girls Professional Baseball League leading them to two playoff appearances and the 1953 AAGPBL championship. Shown here is a 1933 Goudey reprint autographed by Woody English. 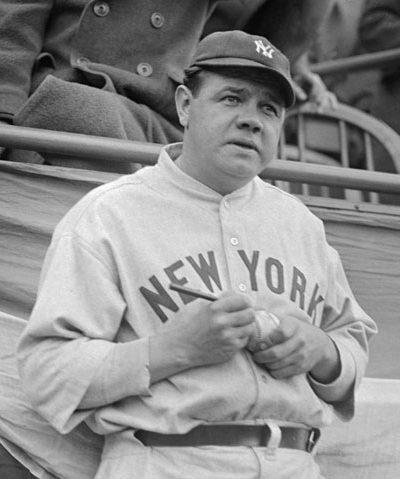 Ruth’s roommate on the road, Reese famously said, “I didn’t really room with Babe Ruth. I roomed with his luggage.”. Regularly called, “the nicest man in baseball”, Reese spent a lifetime in baseball. 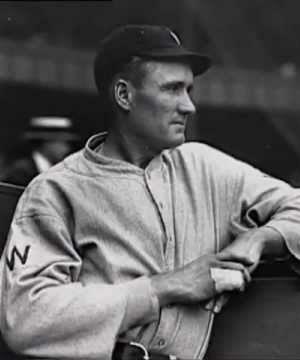 He first played professionally in 1920 for the Pacific Coast League Los Angeles Angels. Though he’d play three season in the Major Leagues, two with the Yankees, and one with the Cardinals, it was his 14 years in the PCL that stand out as a player. After hanging up his spikes, Reese embarked on a long career as a minor league coach, manager, then as a scout and finally as a fungo-hitting coach for the Angels for the last 22 years of his life. During his time with the Halos he made such an impression on Nolan Ryan that the Hall of Fame pitcher named his son “Reese” in his honor. 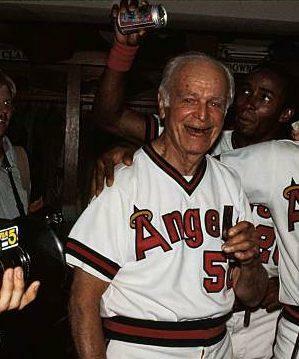 Jimmie Reese was posthumously inducted into the Pacific Coast Hall of Fame in 2003, eight years after his jersey #50 was retired by the Angels.